This week’s theme is Skincare, which is perfect for a first post, given that looking after your skin is the first building block of beauty. Skincare is not the most glamorous of the things we’ll be discussing, but it is so very important. If your skin feels good, you’ll feel more confident, make up will apply more smoothly (and you may end up needing less of it) and you’ll be improving the condition of your skin in the future, too. If you get into good skincare habits now, then as you age, you’ll be able to better understand the needs of your skin and help it accordingly! Skincare basically boils down into two parts: cleaning and hydrating your skin. This doesn’t mean you only need two products, but it shows you that it really is just serving your skin’s basic needs. Well, firstly, although it’s boring, it’s important to drink lots of water – this will make sure that your naked skin looks and feels the best it can. Dehydration can leave your skin grey and dull and sad-looking, so get that bottle open and hydrate yourself! I have very easygoing skin – no spots, no dryness, no sensitivity. I can use pretty much anything on my face, and also don’t suffer particularly from skipping steps. Your mileage may vary; I’m not telling you this to brag, just to warn you that the products I like to use may be way too harsh/too scented/too much for your skin if it’s sensitive. When I wake up, I WASH MY FACE in the shower. At the moment, I’m using Lush Fresh Farmacy to wash my face – this is a solid bar of face wash, but don’t confuse it with soap! Proper soap is too harsh for the thinner skin on your face, and will dry it out. Using a gentle face wash in the shower will freshen up your skin – it’s a complete myth that the skin ‘regenerates’ overnight, so you need to clean it in the morning to remove your night time products and also any sweat or dirt from the night. 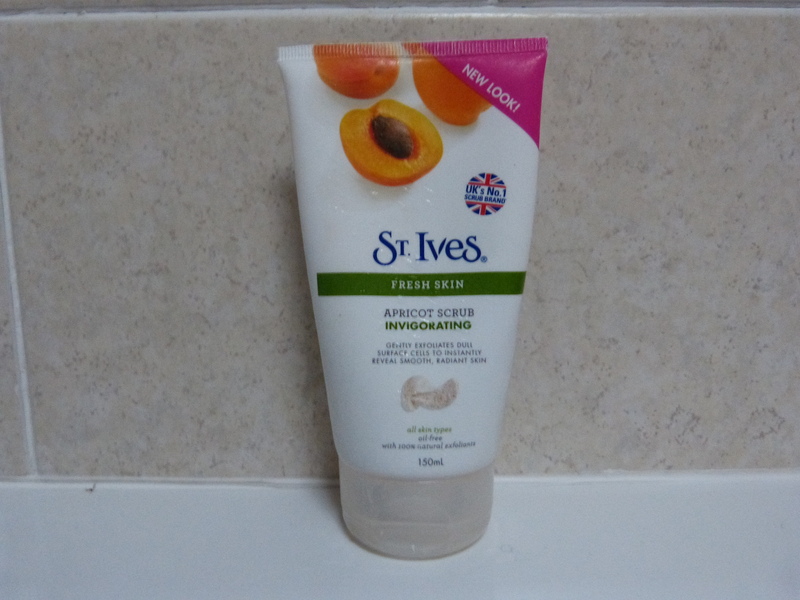 On alternate days, I EXFOLIATE with St Ives Apricot Scrub, (check out my review) which is quite a harsh exfoliator (I prefer to feel like mine’s really doing something). You may want to try something gentler, like Lush Angels on Bare Skin. Exfoliation helps to remove any ingrained dirt and dead skin from your face – the microscopic stuff that you won’t notice, except to notice how much brighter your skin looks when it’s gone. Be careful, though. You don’t want to exfoliate too much or too often, because you can scratch your skin up. Two or three times a week is enough. Next comes DAY CREAM, to replenish the moisture you’ve lost from cleansing. I have slightly dry skin, but it’s very resilient and can take almost any product, so I don’t spend too much on my moisturiser, and I wouldn’t recommend you spend a lot until you know what your skin likes. I really like Johnson and Johnsons’ Daily Essentials day cream for a basic day cream – it is a nice, light cream that’s a good starting point. Because my skin can get a little shiny during the day, I also like the green Garnier Moisture Match (the mattifying one), because it smells amazing, and moisturises without leaving any shine. Both of these are around £5, but are often on special offer, so they’re great to try out. There are five different kinds of Garnier Moisture Match, and they’re all lovely, so pick one based on how your skin is. The last thing in my morning routine is to add some SPF. Sun protection is really important for your skin (yes, even in the UK) because sun damage is the one biggest threat to your skin, and the thing that will age it the fastest. The Johnson’s moisturiser mentioned above contains SPF 15, which will cover you for about a morning, so it’s worth using a higher SPF cream as well, or even reapplying every 3 or 4 hours, if that won’t ruin your make up. I tend to just apply an Ambre Solaire sun cream in Factor 50 once my day cream has sunk in. And that’s it for the morning. At night, I CLEANSE, TONE AND MOISTURISE, which takes a lot less time than you think. Cleansing removes your make up I gently rub a small amount of Lush 9 to 5 into my face, including around my eyes, and then wipe it off with a cotton pad or a warm flannel, depending on how much make up I have on. 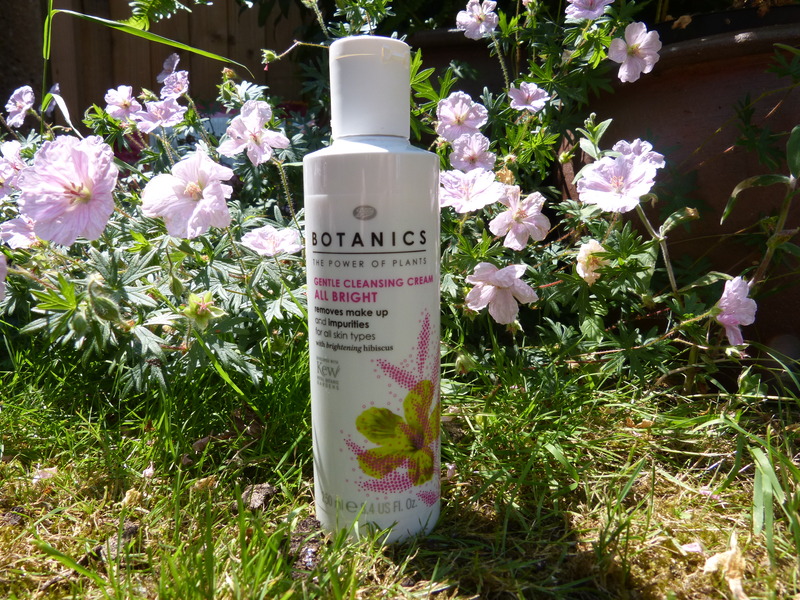 Another great cleanser, which is only about £4, is the Boots Botanics All Bright Cream Cleanser (review here). 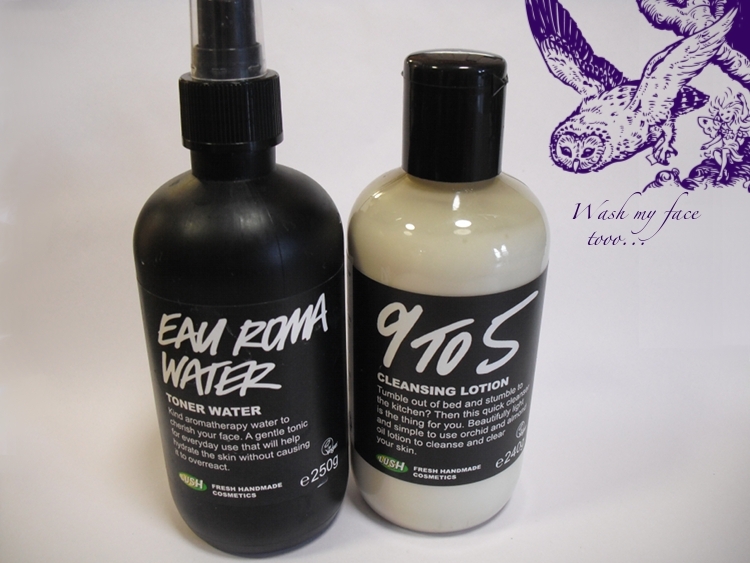 I repeat until all my make up is gone (usually two goes), then spritz my face with Lush Eau Roma toner (review here). A lot of people don’t bother with toner, but I find it makes me feel really clean, and takes away any oiliness from the cleanser. Then moisturising, again to replenish any moisture that was lost from cleansing, and also to add some good stuff to my skin while I have its full attention (ie, while I’m asleep). I like to use a richer night cream than day cream, but again I don’t spend too much – Nivea Pure and Natural night cream is a lovely budget option, only about £5, and really does the job for me. Morning: face wash, sometimes exfoliation, day cream, SPF. Night: cleanser, toner, night cream. Well, I hope some of this advice is useful! Let me know how you get on, and I’d also love you to tell me your skincare routine in a comment – I love seeing what people’s favourite products are. This entry was posted in Beauty and tagged advice, beauty advice, cleanser, day cream, exfoliation, lush, moisturiser, night cream, skincare, st ives, the so project, thesoproject, toiletries, toner. Bookmark the permalink. They do adorable little mini tubes now, in the different varieties – you might like one of the new formulations! I’ve seen the St Ives product featured in a lot of skin care posts, I may have to pick it up & give it a try. Great post 🙂 Really informative! Yes, I love how refreshed your skin feels afterwards! 1 – are cleanser and make up remover the same thing? Does the Boots All Bright cleanser effectively remove eye make up? I use Garnier Essentials make up remover (not cleanser) and toner every night, with Clinique exfoliant wash every now and again, and moisturise morning and night with E45. 2 – Do you know if you can buy pH-balanced moisturising creams that aren’t E45? It drenches my skin so I’d like something lighter – your Garnier one sounds lovely, but my doctor says I need pH-balanced cream for my dry areas on my face. As a general rule anything perfumed or coloured contaisn chemicals that will alter your skin pH and so encourage ezcema and spots of you have sensitive skin, like me. They’re not the same, and many cleansers aren’t suitable for use around the eyes, but I don’t want to add another step to my routine, so I use 9 to 5 or the Boots cleanser over my eyes, and it gets rid of most of it, then swiping toner over my eyelashes kills the mascara! Both cleansers are really gentle, though, I wouldn’t do my eyes with something like Clean and Clear. Also, even if you prefer to use a specific eye make up remover, you need to cleanse the rest of your face anyway. I don’t know about the creams, I’m afraid, but try Lush for advice if your doctor won’t recommend others? I’d hate to put E45 on my face, so heavy! I hope I was clear enough in the post that I have very, very easygoing skin, so please don’t anyone take my advice if you have skin that reacts badly – I like highly-scented and coloured creams and very harsh scrubs!